This area includes high-quality imagery and videos that should be suitable for press purposes. If you are looking for resources that you can't find here, please contact us. About Cogs, summary document (HTML): Description, what makes Cogs unique, Cogs awards, timeline, team and puzzle list. Cogs for PC screenshots (.zip file of 1024 x 768 .jpeg images, 1.5 MB). Or view the online gallery. 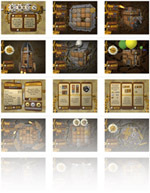 Cogs for iPhone screenshots (.zip file of 480x320 .png images, 7.6 MB). Or view the online gallery. Cogs HD (iPad) screenshots (.zip file of 1024x768 .jpg images, 6.9 MB). Or view the online gallery.